December! This year seems to have just flown by. We began this week with an early family Christmas present. Earlier this year, we saw that Lion King was coming to Fresno. Mark and I have seen it three times--twice in Los Angeles and once in San Francisco. So it's safe to say that it is one of our favorite musicals. This time all four grandkids are old enough to enjoy it as well. The music is beautiful, but the costumes are the most amazing part of this show. The giraffes are my favorite. After the show, the cast was raising money for some good causes, including one here in Fresno. Gabe told the actor playing Pumba that Pumba was his favorite. Pumba, in turn, said Gabe was his very favorite audience member. I loved that, as at age 7, Gabe still happily believes it to be true. It was such a wonderful afternoon. Time spent together with family is my very favorite gift. 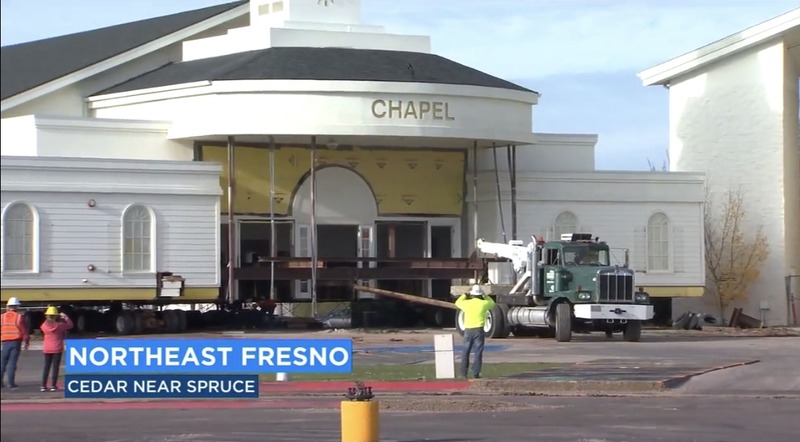 One of the largest churches here in Fresno, Peoples Church, has undertaken a major building project. They have a very large sanctuary and additionally a beautiful chapel. I have photographed quilts in front of each one--those will be separate posts. Anyway, they decided that they wanted to add a children's center. In the same place as the chapel! So...they decided that moving the chapel was the best option. Gabriel keeps telling us that he wants to be an architect, so Mark thought he might enjoy watching the process that goes into moving a building. For weeks, Mark has been picking him up from school every other Thursday and going to check on the status of the move. They have watched the cement pad being poured in the new location. 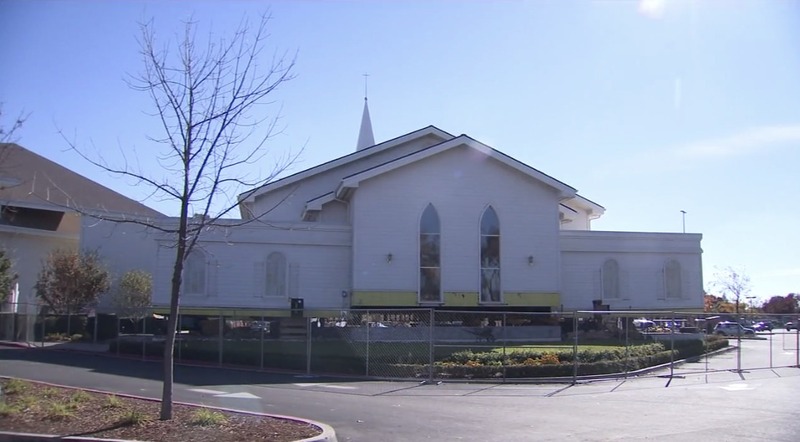 They have watched the facade around the front pillars being removed. 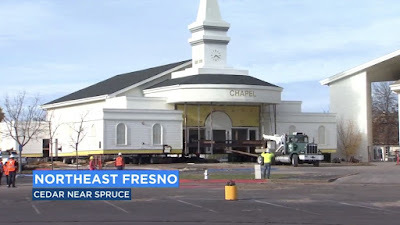 They have watched the building being jacked up and big steel beams put underneath it, on eight dollies (one of the TV stations called them "holy rollers"--ha) in preparation for the move. During all this, Gabe has been completely fascinated, and has even met some of the project managers. I think they were impressed with his interest. 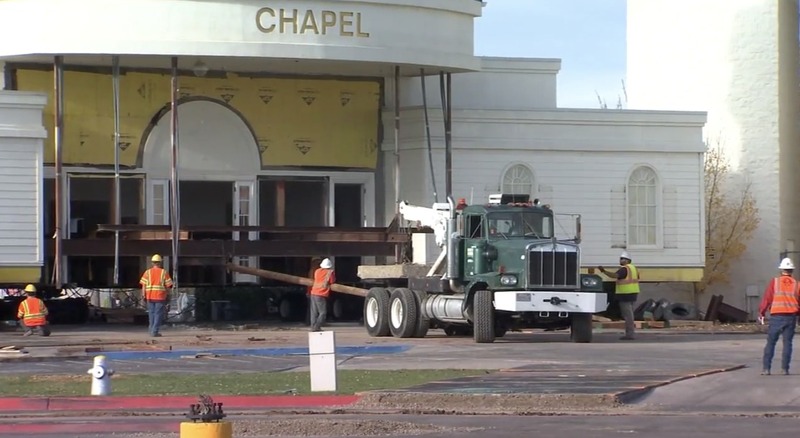 Finally, this week they were able to watch the move begin. The chapel weighs 220 tons and is 8,000 square feet, and they are only moving it 340 feet. This is a series of photos from a video by a local TV station. Gramps had to document this as well. Gabe even got a t-shirt! I think he and Gramps have enjoyed watching this (probably) once-in-a-lifetime event. And I no longer have to be the helper in hanging the Christmas lights outside. Levi has taken over my job! We took him to Red Robin for dinner after all that work. Being the baseball fan that he is, this was his favorite item on the wall of the restaurant. We found this nativity set that Mark made probably the first year we were married--and gave to my parents. My father doesn't really have space in his room for it, and I'm thrilled to have it in our own family room. All the pieces fit together in the manger like puzzle pieces, making for easy storage. I love its simplicity. I finally made this little pillow for Mark. His heart still belongs in the state of Minnesota. How wonderful it is to spend time with grandchildren doing something you both love!! About the Christmas lights...if you put nails at a slant and add string loops to the lights, you can put them up and take them down standing on the ground with a dowel that has two nails in a V shape on the top. I just don't like heights and figured out how to do it last year. The nails are on the back side of the eaves and the loops of string allow the lights to hang below the level of the eaves. I like the light bulb quilt on your post. Lion King was also a favorite of ours. It's such a great family outing. That nativity set is so pretty. Hi, Cindy! I read your blog regularly, though never leave a comment, but today I just had to! I have that same Nativity which my dad made for me the first year my husband and I were married. My dad passed away in 1992, so of course, this is really special to me. He also made one for my mom and I just helped her set it up yesterday. She reminded me just now that the plans for it were in a Better Homes and Gardens magazine, way back in 1976! I love yours with the lights behind it! Enjoy! Another terrific update! Watching buildings move gets more amazing as you understand more and more what is actually happening. Frankly, more interesting than watching a building implode for this girl. How special to have that Nativity set come back to the maker for more enjoyment. Wishing you well this coming week. What a fun post--they've moved some old houses here, but those are nothing like the church move! Glad Mark took Gabe to see it, and that it was safely moved. What a fun Nativity set, and so glad you have it back to enjoy. And fun for the family to see Lion King!